Two New Albums Featuring Me! Yesterday was a busy day for album releases – two albums that I’m on were released! 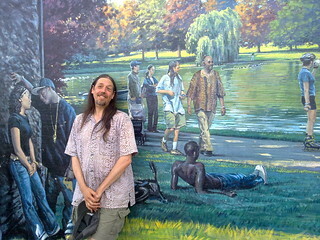 This was recorded in 2010, when Neil and I did two shows together in NY – it was the first time we’d met, though I’d been a fan of his music for a long time (that’s Neil in the pic at the top, stood next to a mural of himself in Newburgh – how many of you have made such an impact on your own town that they included you in a mural? No, me neither…). Anyway, the gigs were streamed (and the online audience dwarfed the small-but-perfectly-formed gaggle of good people in attendance), and I was recording them. Sadly, I was still getting to grips with recording on my netbook, and about half the gig was lost to glitchy audio. But two lovely bits of music were saved – the first was A Meeting Of Minds which is on Live So Far. And this, Hidden Windows, is the second. A single 30 minute journey through myriad musical landscapes. Enjoy! This was a very different kind of recording experience. Steve had written the melody for Magpie Bridge – the centrepiece of the album – and asked me to record it in the studio with him and drummer Mike Shannon. Pretty much everything I’ve done of late has been open/improvised, so it was both a challenge and a lovely change of pace to get to play such a beautifully written melody, followed by a solo over Steve’s lovely chord progression too. I was then able to put down some other bits of mellow ambient stuff, and I really like how it all came out. Steve and I first connected on Myspace, many years ago, so it’s a real privilege to play on his lovely music. On twitter they are @nailmusic and @steveuccello – do go and say hi.